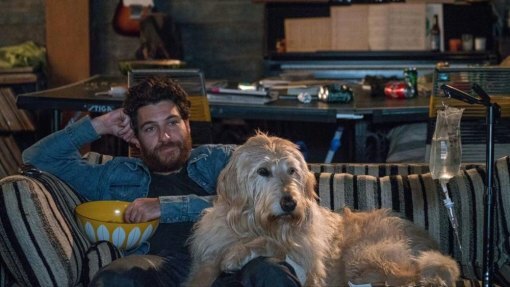 Charlie, Sam, Gertrude, Mabel, and Brandy all get their time to bark, mug, and wag for the camera, especially Charlie an exuberant labradoodle temporarily wrecking the life of already an already messy musician (played by Adam Pally) living in a no pets allowed apartment. Ken ("How to be a Latin Lover," "Children's Hospital") Marino having honed his skills through improv blends a cast of canines and no frills Los Angeles residents into "Dog Days," an ensemble casting multi-story line comedy (i.e. "Love Actually," "New Year's Eve," "Crazy Stupid Love," "He's Just not That Into You") that's an enjoyable summer family outing, allowing four legged friends to teach us more about our species. Nina Dobrev and Tone Bell are mismatched morning-show anchors; Vanessa Hudgens is a barista drooling for a hunky vet (Michael Cassidy) while ignoring an awkward nice guy (Jon Bass); Finn Wolfhard is a snarky teen helping a widower (Ron Cephas Jones) look for his lost pug – which adopted a couple (Eva Longoria, Rob Corddry) miserably struggling to coax their newly adopted daughter (Elizabeth Phoenix Caro) to assimilate into her new world. Juxtaposing a few overlapping lives, the fur babies cement those that solidly attach and those that stray a bit. The overlapping revelation --- dogs bring out the best in people, including the long recognized equivalent of an introductory glass of wine or cup of coffee icebreaker. Unlike the pick up bar artist, fellow dog owners believe that the possession of a pet vets their rep.
Nina Dobrev and Tone Bell, the too serious for "wake up" and a silly, extroverted retired professional athlete, each of whom have dogs slips in elements of the typical romantic comedy without the audience screaming cliche, cliche. They have solid explosive moments , loungy self doubts (mostly Dobrev) and genuinely warm and getting hotter segments.